The Circus World Museum is a place where boys, girls and children of all ages can see how circuses have worked and entertained people for generations. As they say, “experience the thrill that never gets old.” Featuring a Circus Museum, an area called Ringlingville, a wide variety of circus animals and the World’s Largest Circus Wagon Collection, Baraboo’s Circus World Museum is open 10am-4pm daily. History abounds; a series of buildings in the Circus World Museum date back to the 19th century and plenty of plaques will tell you more. 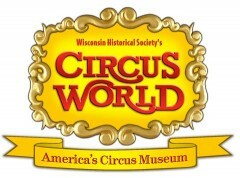 Circus World Museum is right along Highway 113 on the south side of Baraboo; U.S. 12 is to the west and Highway 33 is just to the north.